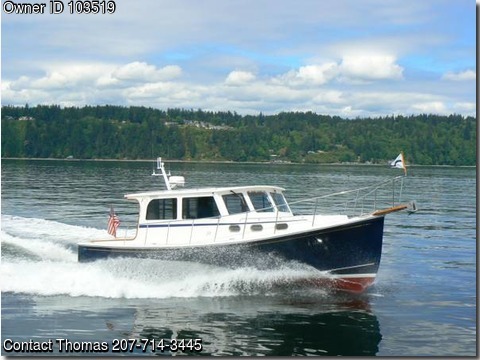 Boat is located in Seattle,WA.Please contact the owner @ 206-714-3445..2001 Duffy Down East lobster style boat. I am just the varnish guy helping post this for a friend. During the years that i have been on the boat it has always been well cared for. The owner is very meticulous and constantly thinking of ways to improve the boat. There were no dollars spared to get it just like he wanted it to be. Here are a few things that have been done in the last couple of years. The swimstep was removed sanded flat on both sides and in the slots and multiple coats of cetol were applied. A new hatch was installed in the cockpit to replace the original work boat style hatch. The back deck was completely repainted at that time. The mast was also very workboatish and has been replaced. The original hand rails were extended further down the sides of the boat. Entry steps into the cockpit were built and installed. The interiour and exteriour varnish was re-done. There is new Garmin electronics, new agm batteries, new anchor wash down pump, new fresh water flush head. A bow thruster has also been installed. The interiour is heated with a diesel heater. The boat is powered by a 3126 cat engine with 1045 hours. This boat is very clean inside and out with no surprises that won't be pleasant. The boat is located in Seattle and the owner would love to answer questions and show the boat. More pictures can be had when requested.